The following will give you an abbreviated version of what we do. Please feel free to email if you have any more questions. What do we do? The Friends of Aussie Heroes are spread all over the country and we make quilts and laundry bags to send to serving members currently on certain deployments mostly in the Middle East, including the ship currently deployed, but also on Peace Keeping Missions in South Sudan, Egypt and Israel. Our quilts and laundry bags are gifts to say thank you to the serving member for their service and the sacrifice that service asks of them and their families. We send items in response to requests from serving members or their loved ones - spouses, family members and friends. Many of our quilts are personalised though not all of them. Our quilts are not works of art, but works of the heart. If you can sew and want to make a quilt or part of a quilt you can find all the specifics with regard to how to make a quilt here. If you look at the top of the blog page, between the heading and the photo collage, you will see a list of pages. These are all useful reference information to assist you. Quilt Size - the size has been determined to fit into a Bx2 sized Aussie Post Box so that you can post them free of charge - as long as you keep the weight under 2kg. Currently I recommend making your quilts around 42-44" wide which is around the width of quilting fabric. The length should be no shorter than 70" and no longer than 75". I would suggest you aim for 70" length as the extra length makes it hard to fit the quilt into a box. Quilt Design - You can choose any design you like for your quilt. We need quilts for guys and girls but just bear in mind that in Afghanistan for example there only about 20% female to 80% male! 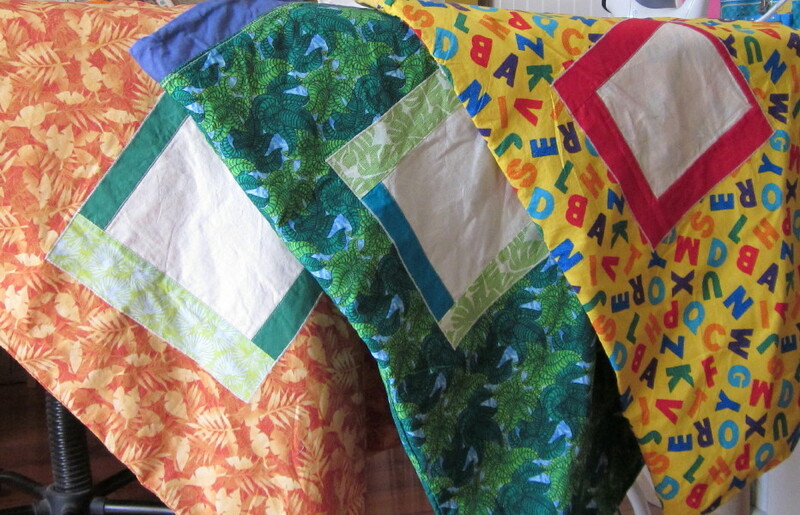 We need four more boy quilts to every girl quilt. Batting - We use either 100% cotton or a wool/poly blend (which is 60% wool/40% polyester) batting as these quilts are used year round. In winter it can get down to -25C in Afghanistan and in summer up to 40C (maybe more?) Both of these battings have been trialled in situ and found to be excellent. The batting rolls I buy from are usually 2.4m wide which means that I can get two quilt side by side if they cut me a little over the length of the quilt. Another option is to buy 3m which gives you enough for three quilts. 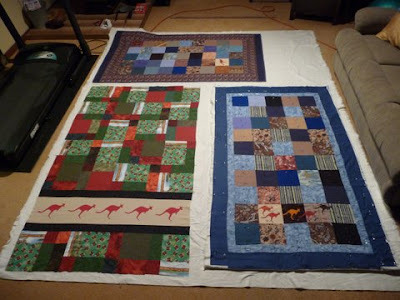 In spite of appearances the three quilts below are all the specified size and are laid out on 3m of batting. NOTE - three quilts will only fit on 3m of batting if they are all the minimum length of 70". you will need to buy a little more than 3m if they are a bit longer. Quilting - is a matter of personal choice and ability. Straight line quilting is perfectly fine but if you can stipple or do fancier patterns ..... fill yer boots as they say! Label - Each quilt is to have an Aussie Heroes label on it. I print my labels on Printable Fabric available from printablefabric.com.au The label MUST include the blog name and the blog email address. BOTH are required. Please include the blog name and AHQ email address so that they always know how to get in touch with Aussie Heroes. Do not assume that the blog details are sufficient. In some areas they cannot access it at all. You are more than welcome to expand the label detail to include your personal details or you may add a second label. You are also more than welcome, in fact encouraged, to add a letter with your contact details with each parcel you send. You can make your own labels or you can get some from Hillary who has made this kind offer. For the initiated a BOM is a Block of the Month. Each month Sandy introduces a simple block, complete with a tutorial, then anyone who is interested can make up one or more blocks and send them in - getting them into the mail by the end of the month. They are then made up into a quilt, often with wonderful results! We started off with a simple nine patch block. and ended up with some gorgeous quilts. Maybe you are wondering why we started making laundry bags. The full story can be found in the Brief History Page but the short story is this. The guys and gals are issued with white, blue or green laundry bags and the only way to tell one from another is by hand written initials usually in black marker pen. According to my sources bags go missing all the time as people collect the wrong bag in error. The lovely Warrant Officer's wife (see brief History if you want to know more about the Lovely Warrant Officer) made him his own laundry bag that was distinctive in colour and voila! he found his laundry easily there after! In this picture you can see the NM laundry bag stands out! No one will be taking it by accident. You can use normal patchwork fabric or heavier weight fabric for the outer and calico or homespun weight for the lining. Something like light weight curtaining fabric - not the rubber backed fabric - is excellent. If you don't have a heavier fabric for the outer then use normal quilting fabric. The sturdier the fabric and the stitching the longer these bags will last. Also, and most important - all fabrics - particularly those pesky reds need to be pre-washed. Soldiers tend not to like wearing PINK uniforms! Please also try not to make any two laundry bags the same. As the military issue bags are white, plain blue and plain green I tend to stay away from plain versions of these colours. The most important feature of our bags is that they be DISTINCTIVE so they can be easily picked out from a pile of hundreds! The fabrics don't have to be pretty - just serviceable. Bright colours, checks, strips dots, anything - just bear in mind you are making laundry bags mostly for men. If I make more than one from the same fabric I vary the colour of the patches and the cord channel. When we have them we applique large initials on bags but that is not necessary. It is nice to do, if you if you have the recipient's name but I want to be able to send extra bags over to be handed to those who need them and I don't have a never ending supply of initials. Our patches are fused on and then stitched down. I use satin stitch - you can stitch however you like but stitch well so that it stands up to wear and tear. Lately I have received a few bags with fancy stitching and the patches are fraying after the first wash. Make sure you attach your patch before you sew up your bag - so much easier! The part of the bag that gets the most wear and tear is the draw string channel. A sturdier fabric like twill works well but only if you have it. This is also a good place to top stitch and reinforce. Laundry facilities have changed somewhat since we started and now I believe that the clothes are no-longer washed in the bags. Therefore we do not need to be so concerned about the cord as we used to be. A good cotton cord or cheap cotton shoe laces will do the trick See those shown in the pictures. 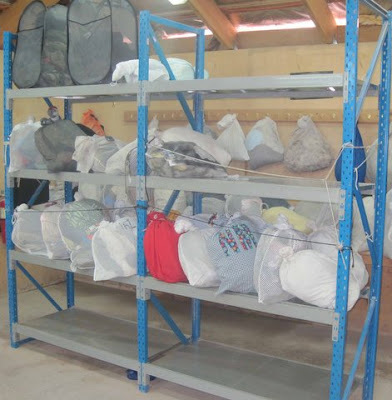 Laundry bags can be posted over in a batch with other bags, on their own or with a quilt. We try to send one with every quilt that is sent. This is what we call it when a serving member or their family find us and request a quilt or a laundry bag. We love these requests as it means that we usually have some sort of personal contact with the recipient and/or their family. In order to meet the demands of the Special Requests I have a list of volunteers who are happy to put a quilt together on request. Normally these quilts need to be finished and posted within five weeks. Quicker is even better if you can realistically manage it. Every Monday I publish a request list on the blog and those that want to sew for us nominate to make a quilt or a bag if they wish to. If you have completed a quilt, or even have it at flimsy or quilt top stage and are planning to quilt complete in it the near future, it would be great if you could email me a picture so that I can file it away in the Quilts in Waiting File. We have been asked to provide four quilts that can be held in the hospital in Kandahar to be given to any wounded soldiers who transit through there on their way to hospital in Germany. So far two of our quilts have been used and replacements have been sent. I also try to keep several quilts ready in Australia so that they can replace any that are used as soon as we get word of their need. The quilts will be sent direct to the Chaplain who passes them on to the hospital for storage. As long as we pack our goodies into a Bx2 Aussie Post box and keep the weight under 2kg we can send the boxes free of charge. Our quilts are designed to fold up and fit it one of these boxes comfortably leaving just enough room for a laundry bag and a few goodies. Detailed information is on a separate page here. I would appreciate if you could read it before you send your first box. For Aussie Heroes the really important thing to do is to label the boxes "From Aussie Heroes." Spread the name girls! We want everyone to know the Aussie Hero name. If you look at the Pages on the Aussie Heroes Blog you will see one called Extra Things You Can Include. You will see there is quite a list. This is generally aimed at the guys serving in the outposts where amenities are limited, not so much Dubai and our ships at sea. I try to always include a packet of Aussie biscuits if there is room or Aussie lollies. I also heard from one of the guys that lip balm, the Chapstick kind, is really popular. They get given a white zinc like lip balm and apparently it is AWFUL. Another thing I was told is that roll on deodorant is great. Please always include a note or card from yourself with your contact details so that you can be thanked for your efforts. How can non-sewers get involved. If you can't sew but still want to help check out the list of options here. One of the most useful things you could do is donate some money. Don't get me wrong, I hate asking for money, but the reality is that I received a bunch of quilt tops here in Sydney, plus a lot of the BOM quilts and all of those require batting. I also have to pay for a lot of postage, fabric, cord and all the incidentals that go along with running Aussie Heroes. We have a bank account and soon there will be a Paypal button to facilitate donations but in the mean time if you contact me I can give you the bank account details. Even small donations are welcome as every little bit adds up. Please feel free to email if you have any more questions.